National Bartending School is the best place to start your journey into the exciting world of bartending! A highly reviewed school experience with exceptional student ratings! Conveniently scheduled Bartending classes 6 days a per week! Excellent job placement- before and after you graduate! World class mock bar for practical training! Knowledgeable staff and instructors to guide you on your mixology journey! National Bartending Schools stands out among the bartending schools in California as the best school with the most flexible scheduling available! Our terrific staff, extremely knowledgeable educators, and well equipped classrooms all provide an excellent training environment. National Bartending School also offers the best staffing service in the state, with employment available for both students and alumni. Contact us at (661) 673-5100 to get started! 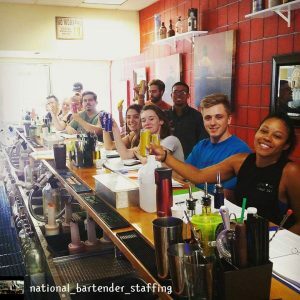 National Bartenders offers atop of the line, streamlined education at a collection of campuses in California, Nevada, Colorado, Wisconsin, and New York! Each school is a unique campus with an excellent staff and top notch training facility, and each is equally dedicated to making your dreams of bartending come true. In addition to convenient locations, we offer all of our students an affordable tuition, extensive work placement opportunities, and flexible scheduling. We at National Bartending School believe that a school degree or license should be an easily achievable goal for a typical adult student. We have designed a curriculum and an educational experience with this in mind, and are dedicated to your success. In addition, we provide a concise and to-the-point textbook, written for our classes, and included with tuition! There are never any hidden costs at NBS! National Bartending Schools know that there are multiple keys to success… and the ability to get to your school in a short amount of time is a big one. Convenience is always key, and a centrally located school campus is essential to a good learning experience. This is why we have schools located all over California, and are currently expanding our reach into Nevada, Colorado, Wisconsin, and New York! No matter where you live, there is a campus near! All of our instructors bring a rich history of bartending with them, and many of them still work in the industry. This enables them to stay on top of current trends and then teach them to their students. Some are even early graduates of our National Bartending Schools training programs! Teachers are always here to help you with any questions you may have, so feel free to reach out! Whether you need some extra instruction, need to take a practice test, or just need some moral support, we are here for you every step of the way! One of the best parts of NBS is our work placement program, which is the ONLY program in Southern California that GUARANTEES students employment upon graduation. We also provide work opportunities during school for our enrolled students. Many students earn their tuition back very quickly, by working just a few events. NBS encourages our current students to apply for event jobs as servers and bar backs. This is a great way to include hospitality services on your resume!. Once you have become a certified bartender, we offer you work as an event bartender, as well as the ability to apply for the many full time and part time jobs listed each week through our company. Local businesses come to us monthly in droves to find them new employees. They know that our school produces the best in the business! When you graduate, the jobs will be waiting! Set Your Own Schedule- and Revise it Anytime! Here at NBS, we literally have classes available several times per day, up to seven days per week. There are NO set schedules; you pick and choose when to attend! Our rotating cycle of classes works well with the majority of our student’s work schedules, so there is always a class that is easy for you to find the time for. You do not have to sign up for the individual classes prior to attending, either. Just show up, sign in, and attend.. If a class isn’t in session, come in anyways and log a few hours of practice time into our mock bar. Practice hours count as towards your mandatory 40 hours for your license! With our class availability, you can obtain your licensing in as little as two weeks! You can also choose to go at a slower pace and spread out your classes. It’s all entirely up to you, and we are here to support your choices every step of the way. Visit Us- Start Your Future! National Bartending School near Acton is open Monday through Saturday every week! Please feel free to visit the school, or call (661) 673-5100 to speak with instructors and staff. Come see that National Bartenders is right for you!